This Carbon Fiber rotary dial table was designed by our composite engineers and build by our composite technicians in house. Definition: The Rotary Dial Indexing Table is usually (but not exclusively) a circular plate manufactured from Aluminum, Steel, Stainless Steel and in some cases a thermoplastic such has high density polyethylene or polyurethane. Use: Rotary Dial Indexing Table are used on Automated Assembly Machines in the repetitious component assembly process. The Rotary Dial Indexing Table is a integral part of Automated assembly machines indexing operation which comprises of a indexer, rotary dial table and tooling. The indexer provides the mechanical intermittent motion. The Dial table provides the rotating platform on which tooling is attached close to the dial periphery. The tooling provides the necessary support and positioning for part assembly. The rotary dial indexing process is all about speed, positioning, accuracy, and durability to perform millions of continuous repetitious operations over many years. Advantages: The primary goal of the dial indexing process is to produce as many parts as possible in the least amount of time without compromising positioning, accuracy and durability. 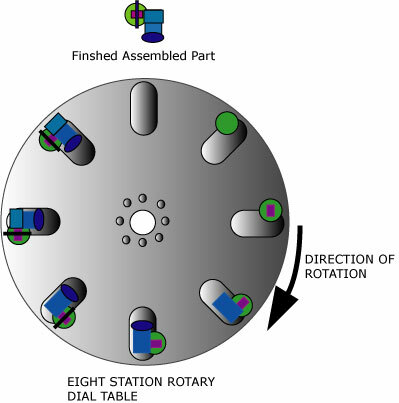 While traditional materials such as Aluminum, Steel and Stainless Steel have served the Automated Assembly rotary indexing industry well over many years, they have a performance ceiling. Illstreet Composites has engineered a product which provides a quantum reduction in the weight of a Rotary Dial Indexing Table by re-designing the table from a Carbon Fiber Composite Disc material. Performance ceiling is a result of Inertia due to the weight of the Rotary Dial Table and Tooling materials. Inertia and subsequent torque required to start and stop the intermittent rotational motion of the dial table limits the performance (speed) of the indexer.